Earlier this year I told myself that I was going to put more effort into Steelhead fishing. Ever since my last successful Huron trip (1/2/2016) I have been half-assing it and not really trying. I was putting more emphasis on what fly I was using instead of working on my mechanics or presentation. With that in mind, I made the effort to get my Switch rod and line combos tuned in and practiced whenever I could. The week in Alaska helped a lot but I should have devoted more time to using my two hand rods. I’m to the point now where I just need some fine tuning on my casting and presentation. 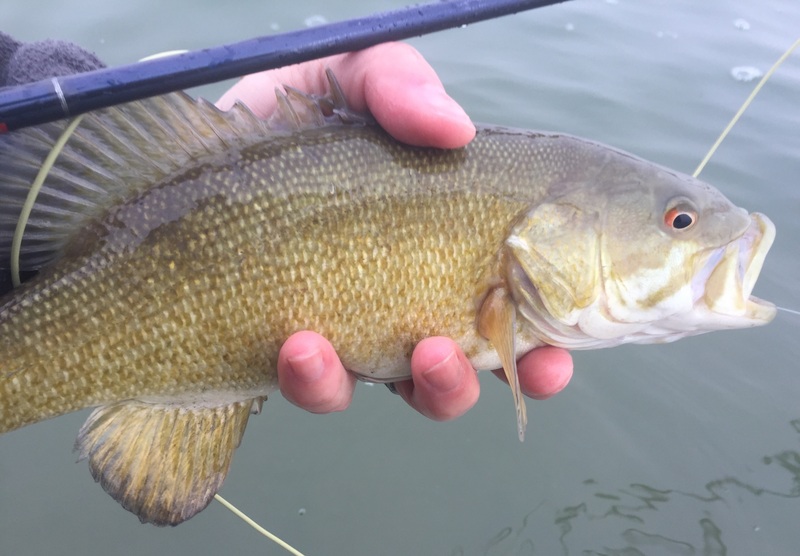 As with walleye fishing, it doesn’t matter what fly I’m using if I’m not putting it in the strike zone. Now that walleye fishing is pretty much over for me it’s time to concentrate on Steel. 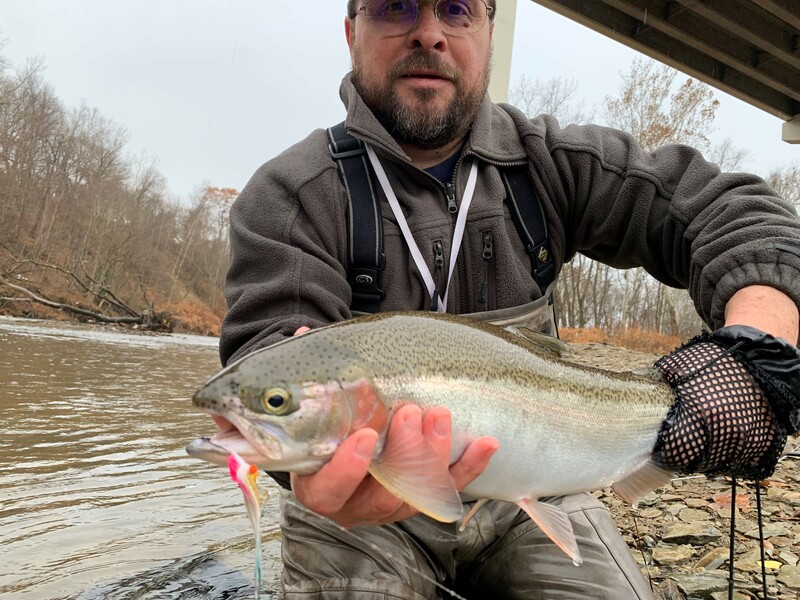 A few weeks back I contacted Patrick Robinson of Steelhead Alley Outfitters (SAO) to set me up for a full day guided trip. Pat put my trip together for Alaska and I have already fished with the owner, Greg Senyo, and one of their guides. I thought about getting a trip booked with my previous guide, Nate Miller, but I wanted to learn more and I figure time spent with other guides would be beneficial. So I just let Pat decide and he signed me up for a day with Josh Trammell for Saturday, 12/1/18. Josh kept tabs on the flow rates throughout the week and told me the day before we would be fishing Elk Creek in the morning. SAO fishes the Erie tributaries from The Vermillion in Ohio to Elk Creek in Pennsylvania. Flow rates determine which rivers are fishable so the guides pay attention to them daily. I was doing the same thing and I figured we would be fishing the creeks in the NE corner of Ohio. Josh told me where to meet him Saturday morning at 6:45 am and from there we headed towards Elk Creek. SAO has access to some private land on the creek which is nice. This river can get very crowded but with it being deer season more people were hunting instead of fishing. Once we got my 7 wt Chromer rigged up Josh pointed out where to start fishing and I did just that. The first run didn’t produce anything so we moved down to the next run. At the end of the drift on my 5th or 6th cast I started to go through the motion of giving the fly a couple of “pulses” to try and entice a follower. I do this by just pulsing the rod back and forth while the fly is straight downstream from me just dangling in the current. As I was about to strip line in I had a hit. It caught me completely off guard and instead of keeping my rod parallel to the river with my hook set I did the Orvis straight up and out of his mouth hook set. Just that quick the fish was gone. I regrouped and about 5 minutes later I had another hit. This time I did everything right and I drove that hook home. A few minutes later my first fish of the day was in the net. After a few pics and a successful release I made my back up to the start of the run and started over. On my next cast I had another hit as I was mending my line. Needless to say I didn’t get a good hook set with the slack line and my rod being pointed upstream. I fished the rest of the run anyways with no further luck. While all this was going on Josh was on the phone with another SAO guide who was out with a Father and his 9 year old son. They weren’t getting into any fish and he was checking to see how we were doing. Josh asked me if I wanted to fish another river and I agreed. Josh told them they could have the hole and we moved. on. I found out later that the boy (Augie) ended up catching his first steelhead from that hole. While we fished the next run Josh asked me if it was okay for him to point out a few things on my cast. I said “please do” and he told me to slow down some and quit forcing the cast. Let the rod do the work and keep that line at a 45 degree angle to the river. He went on to tell me that when I cast straight across I get a big bow in my line and the current will point the fly head on to the fish instead of to the side. 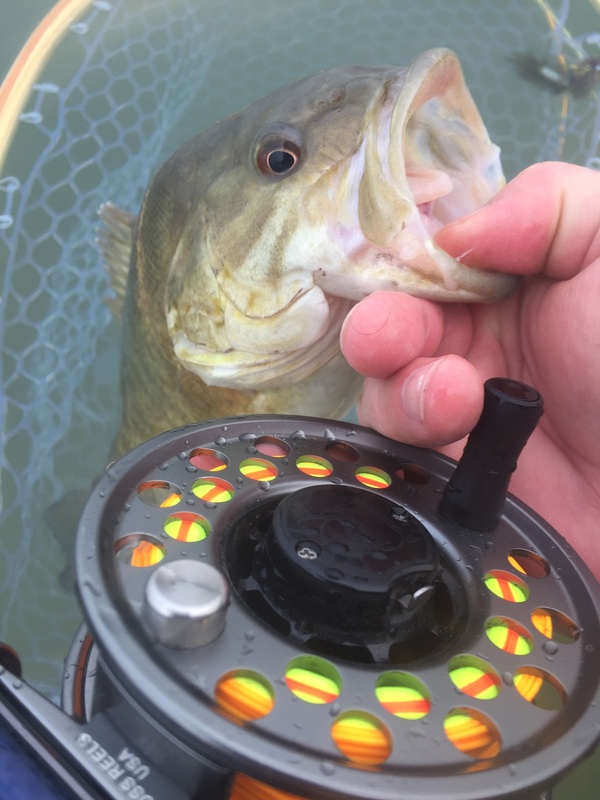 A side view of the fly will produce more strikes then a head on shot. This is what I wanted, to “tweak” my presentation. That run didn’t produce anything so we decided to try Conneaut Creek next. That was fine with me since it was west and closer to home. We stopped along the way and picked up my car before we drove to our next stop. There were more fishermen here than at Elk so we headed upstream and away form the crowds. The first two stops didn’t produce any fish and we were running out of time. We tried one more hole and I started casting. I was about 20 minutes in when Josh told me that after a few more casts we would be BAM. AIRBORNE, FISH ON! Talk about a last second fish. After a couple of pics we sent her on her way and headed in before the rain really started to fall. After getting rained on all last weekend I wasn’t looking forward to it happening again. I went 2/4 today, all on the swing so I wasn’t going to complain. After today’s lessons (leaders, line management, presentation, reading water) I feel confident that I can be a little more consistent with my success. Of course a lot of that will depend on the fish. 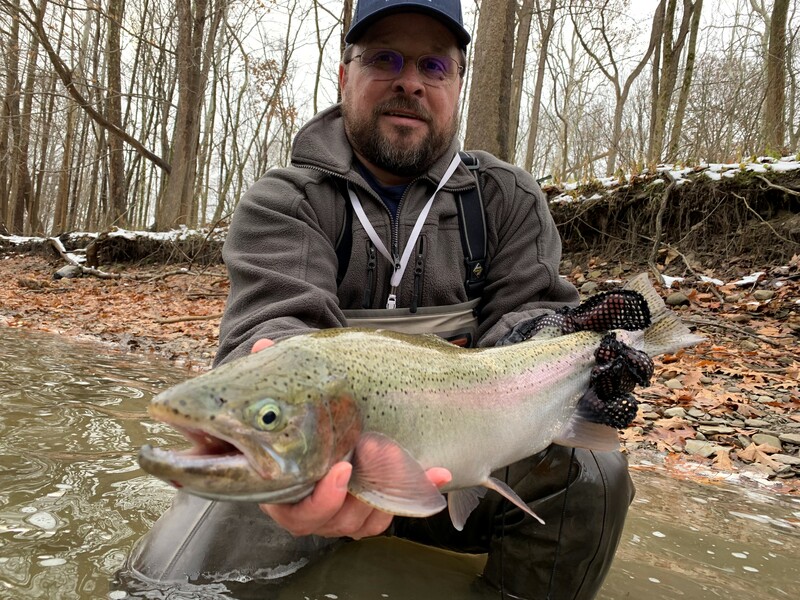 Steelhead are nothing like walleye. 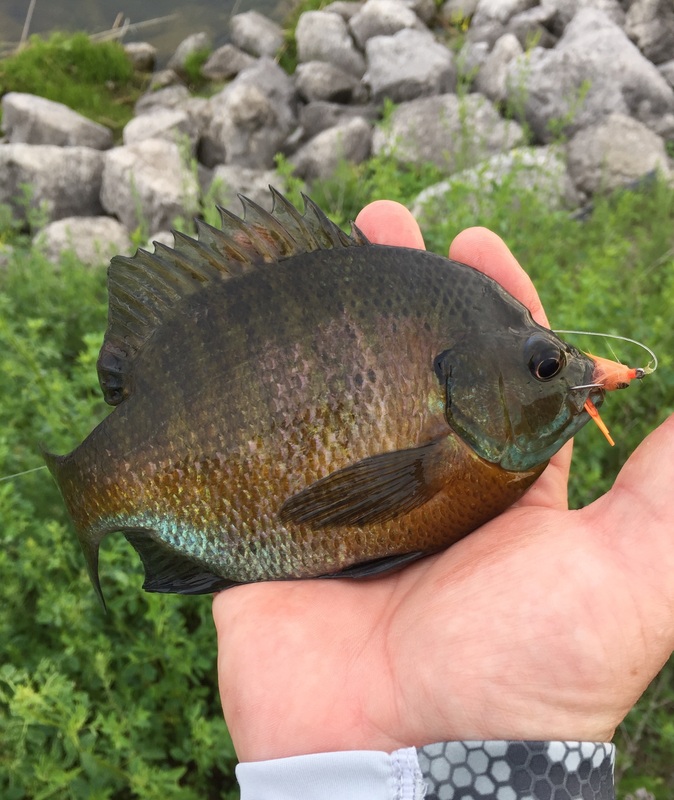 This past Sunday (6/3) was my first fly fishing trip to my super secret, catch just about anything, spot. I expected the carp to be spawning but I was hoping I would find a few asexual carp that didn’t care about that thing or a few that were already done. My main fear was being over run my carp shooters. There was a big bowfishing tournament going on this weekend and I was hoping none of them would be in my area. Turns out none of them were in my area. I got to the parking lot around 7, rigged up my TFO Clouser 5 wt and my Orvis Helios II 7 wt and started the long trek. Overcast skies and a slight NE breeze made for an enjoyable walk up to my first stop, which wasn’t because of a fish. It was this girl doing her thing. 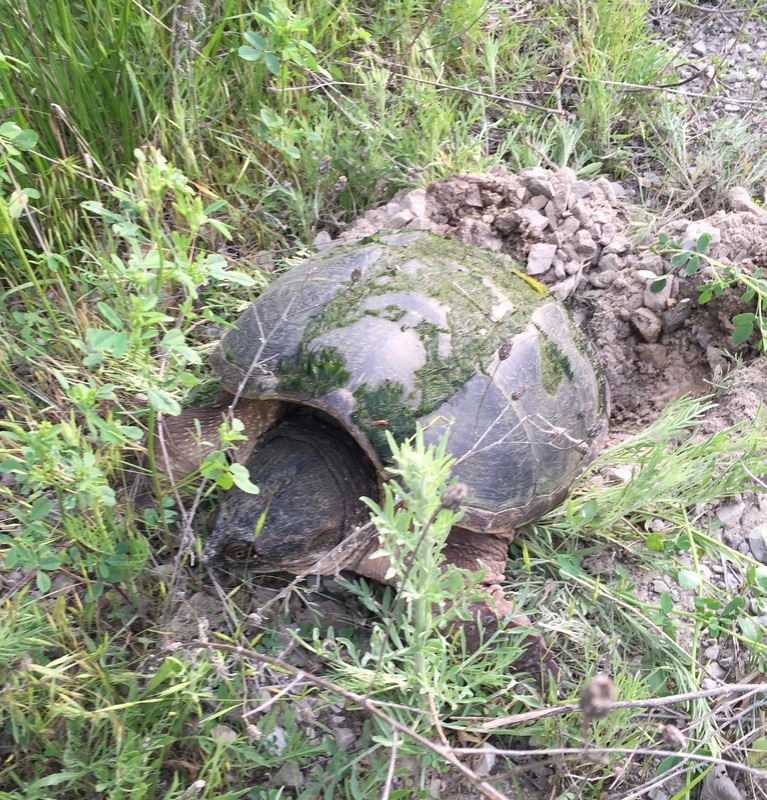 I haven’t found a snapping turtle laying eggs since my parent’s 50th wedding anniversary weekend in St. Ignace. I feel sorry for these little guys though. They won’t have an easy hike across a beach to water. She laid her eggs on top of a dirt road that sits on top of a bunch of boulders. I’ll have to look up the incubation time for snapper eggs and see if I can time when they hatch. It would be cool to see. After that I continued my walk until I spotted some carp doing the spawn thing. They were jumping around and splashing about, having themselves a grand old time. Along the shoreline I did spot about a 10 pounder cruising along. 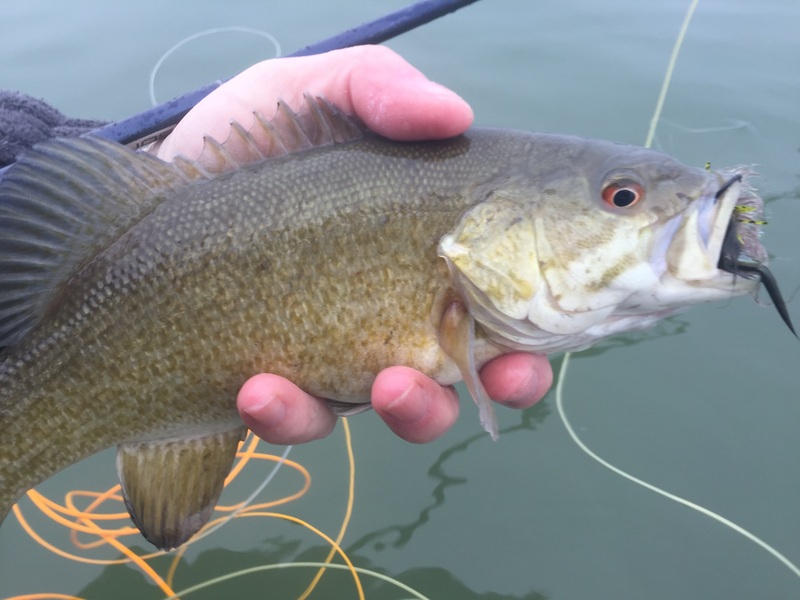 He was mouthing some floating reeds as I made my first cast out in front of him. I let the fly sink as he slowly started to swim my way. When he was about 3 feet out I slowly began to strip the fly in. I lost sight of the fly as it dropped between some rocks. The carp saw it though so I just stopped and let him swim in. He started to nose down and tail up right over the fly. I saw his mouth open and it looked like he sucked in the fly. I raised up to set the hook and missed him completely. He didn’t stick around to figure out what was going on and I started cursing myself for getting so twitchy. I know better than that. Oh well, on to the next one. The rest of the carp fishing was pretty uneventful. I saw a fair number of carp but they were all doing the same thing. Mouthing pulled reeds floating on the surface and not paying much attention to anything else. The water was very dark so it was hard to see. Not sure why, it wasn’t dirty, just dark. I couldn’t even see any gills. The only one I did catch was by accident while I was casting to a carp. After a few hours it started to sprinkle some so I headed back to the car. Along the way I spotted a Bowfin feeding like a carp, head down and tail up. I flipped my fly out near him and let it sink right down alongside of him. I saw him react to it and this time I drove the hook home. I played around with him for about a minute or so and eventually lost him as I was trying to land him. I wasn’t going to keep him anyways so it was no big deal. At least I didn’t get completely skunked and I’ll be back many times this summer. Last item of note was a White Pelican sighting as I was heading back. It was the first one I had seen in a few years. There was a bird watcher riding out as I was heading in so I told him about it and where he landed. Hope he got some decent pictures. Kind of late in the year for one to be migrating north. This season has everything screwed up. We went from winter to summer for a week and then back to Spring. I’m going steelhead fishing next weekend on the St. Mary’s rapids. Never expected to be fishing for them in June. The water coming out of Lake Superior is still in the 40 degree range. Not that I’m complaining. I had so many things going on last month I thought I was going to miss my chance. Hope I get one this time. This will be my fourth trip up there and all I have caught are Atlantic’s. That was the song, and the video of Deadpool singing it, stuck in my head all morning long this past Saturday. 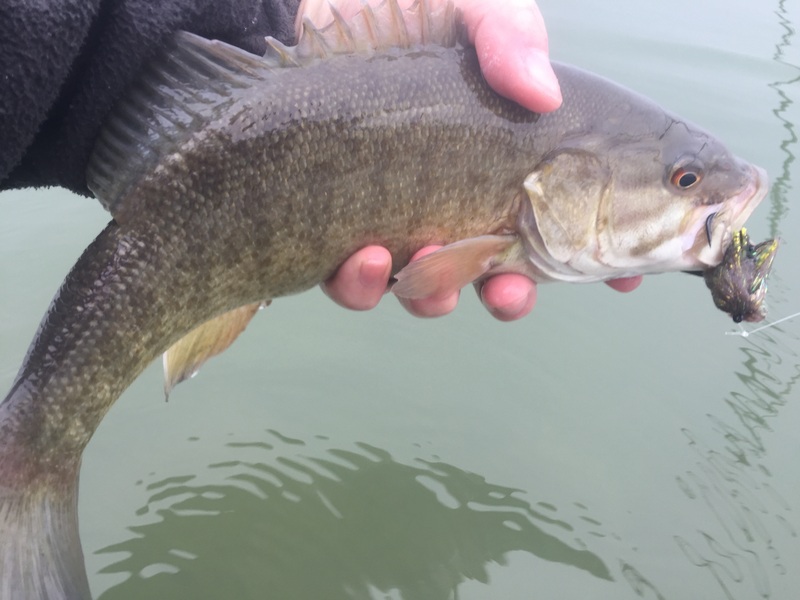 I had decided to go up to Port Austin to fish for Pre-Spawn Smallmouth’s on the flats several weeks ago and of course the weather turned to crap. The rain pretty much covered the whole state so I wasn’t alone. I made the most of it though. I had a friend along (Non Fishing Muggle Type) so we stopped at the Farmer’s Market in Port Austin. 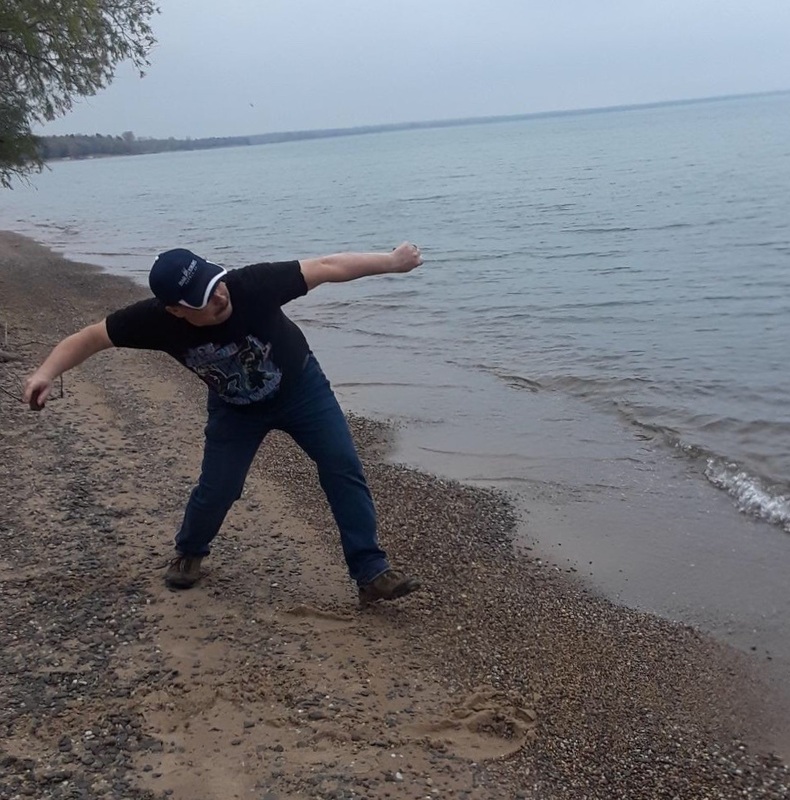 Bummed around Caseville a bit and stopped at a local beach near Grindstone City where i skipped stones to help pass the time. At one point we stopped at a public access area and found about 2 dozen fishermen wading the bay and doing a whole bunch of casting and not a lot of catching. I was beginning to think that my weekend was going to be a bust but as the day progressed the rain let up and the wind slowly began to lie down. We went back to the same public access spot in the evening and this time all the fishermen were gone, except for two that looked they were done for the day. I started to talk to them and they said they were waiting for their friend who was still out there. Sure enough, about a quarter mile out there was one lone fishermen casting away. They said he was catching fish and a minute later I saw his net hit the water. That was all the convincing I needed. On went the waders, broke out the Orvis Helios 7wt, tied on a weighted sculpin and started the long trek out. Eventually I reached the end of my wading depth limits (Damn my “S” gene) and started casting. It took a few minutes to knock the rust off but eventually I was making a decent enough cast. I just hoped they were far enough to get to the fish. A couple of minutes later I got my answer. After that it was pretty much game on for the next hour. I was far enough from the other guy to keep from interfering but close enough so we could talk. We were both catching a lot of fish but the majority were in the 12 inch range. About 30 minutes later his friends started yelling and he took that as his cue to get going, not that he wanted to but they were his ride. He wished me good luck and headed back to shore. After he left fishing slowed up for a bit but not enough to keep me from leaving. I was hoping for a bigger fish and after about 10 minutes I had one. 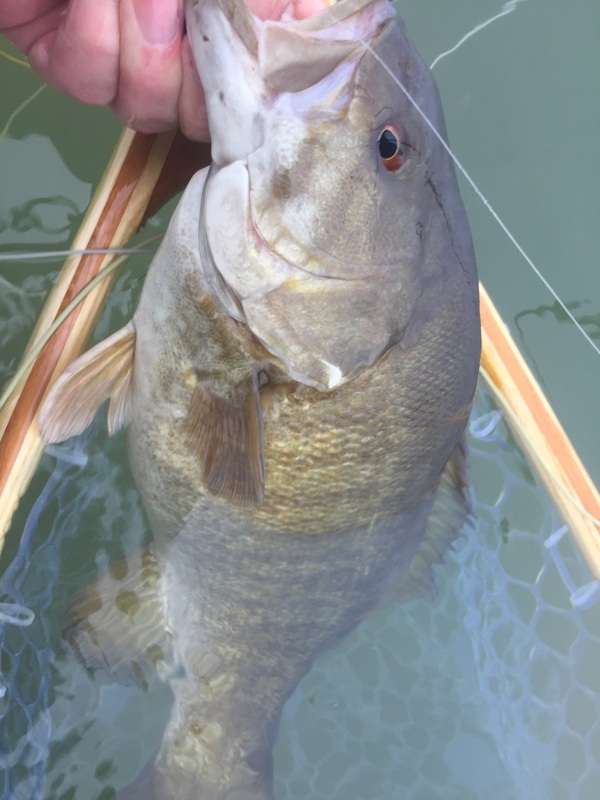 He wasn’t going to break any records but he was still one of my bigger Smallmouth on a fly. After a quick pic I sent him on his way and got back to business. 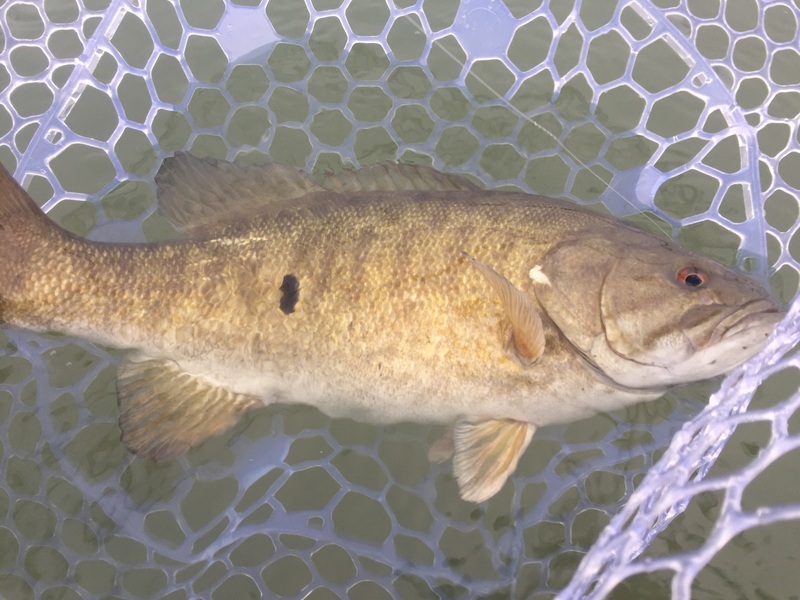 Every time I caught another bass I would tell myself this would be the last one and I would head in. After 13 fish I finally did, it helped that I ended it on a good note. All told I ended up catching 13 and losing 2. Not bad for a little over an hour’s worth of fishing in a place I never had been to before. Earlier in the day I was sure the whole weekend was going to be a bust but instead it turned out to be one of the more enjoyable times I have had fly fishing. I’ll definitely be coming back up here again to do this. Doubt it will be this year but the more I think about it, staying home next year and taking long weekends to local spots is sounding pretty good. Next time I’ll bring my kayak along. 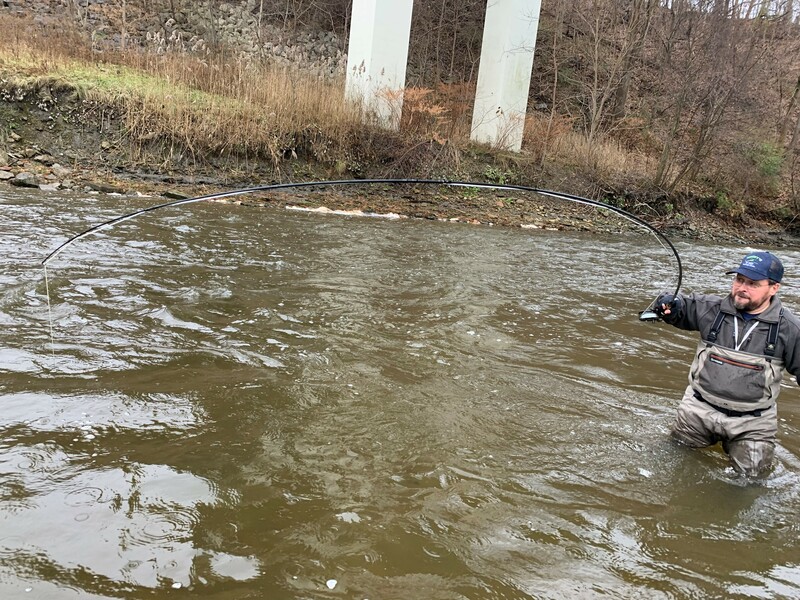 A group from the Michigan Fly Fishing Club were up for the weekend and most of them were fishing the local rivers to avoid the wind. I found out later that some of them did pretty good. As for me my friend and I we went to dinner, sat around the bonfire for a bit and then passed out in my camper. The next morning the wind had picked up overnight and there were now whitecaps in the area I was fishing 12 hours earlier. I took that as a sign to just pack up the Mobile Steelhead Command Center and head for home. Via the long way so I could check all the ports along the Thumb to see if anyone was catching anything. 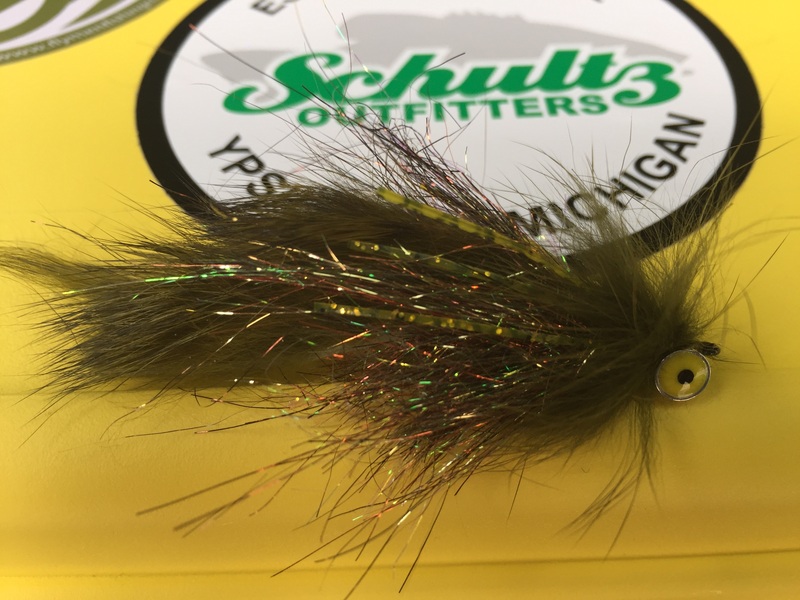 The Sculpin Pattern that caught them all.